Let’s face it, it happens to all of us: you hop in the car for a drive up the hill and splat! You’ve got a windshield covered with mag chloride and you are freshly out of windshield washer fluid! Be proactive this weekend and give that windshield – and our other safety suggestions below – your full attention! Hope these tips help you and your family stay safe and happy on the road. 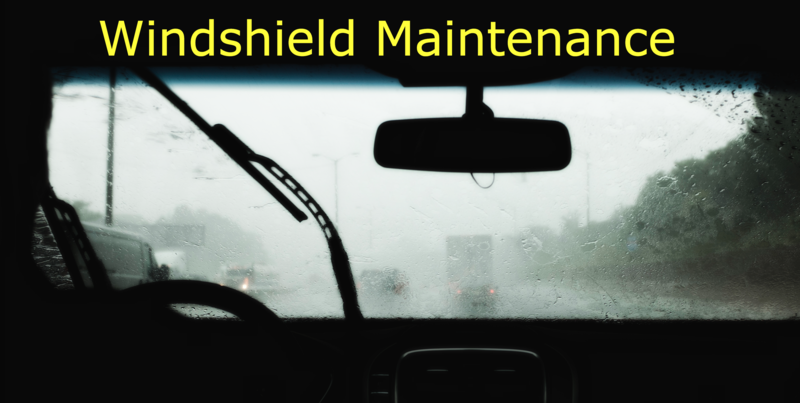 Windshields have a tendency to get pits and cracks over time. During the day, you might not even notice anything. But the instant someone’s headlights shine through your windshield, you could find yourself blinded more than is necessary. Now is a great time to replace a windshield that is limiting your visibility. This is the simplest maintenance tip we can give you: before you hit the road, open the hood (and rear hatch), check your windshield fluid reservoir(s), and top it off! Easy, right? And while you’re at it, park the rest of that gallon jug in your trunk or way-back in case you need to refill along the way. Done! 3) if you still have streaks, it’s time to replace them. Many people position their side mirrors so they can see the back end of their vehicle. This actually creates blind spots and could prevent you from seeing someone in the next lane. It’s best to position your side mirrors further out so they are just picking up the edge of what you can see in your rear-view mirror. A good way to do this is to lean your head back against the headrest and adjust the mirrors so they are just beyond where you can see the back of your car. Now when you sit normally, you’ll be able to see more of the road beside and behind your vehicle. This might take a little getting used to, but you will likely find that you prefer the extra visibility to seeing your car’s rear. Hopefully you won’t end up on the side of the road. But if you do, flares can keep other drivers from running into you – especially in low-visibility situations. They can also call attention to the fact that you need some help. An emergency strobe (or beacon) is another great tool. It runs on batteries and flashes brightly to get the attention of emergency vehicles or other drivers when you need assistance. It’s so basic that it’s probably the easiest to overlook. Remember to check your headlights, brake lights, and hazards to make sure they’re all in good, working condition. While you’re at it, make sure they are CLEAN – give ’em a quick wipe down. If they are cracked, foggy, or discolored the lenses may need to be replaced. Give other drivers all the help they need to see you to avoid accidents. When it comes to driving, being invisible is a bad thing. Make sure you prepare yourself and your vehicle for the darker months. Also, make sure your car is in good health so you don’t get stranded in winter weather. Bring it by Golden Triangle Auto Care in downtown Denver for a free 30-point inspection.